A Song Sparrow (Melospiza melodia) singing in the marsh at Elgin Heritage Park near Crescent Beach, British Columbia, Canada. 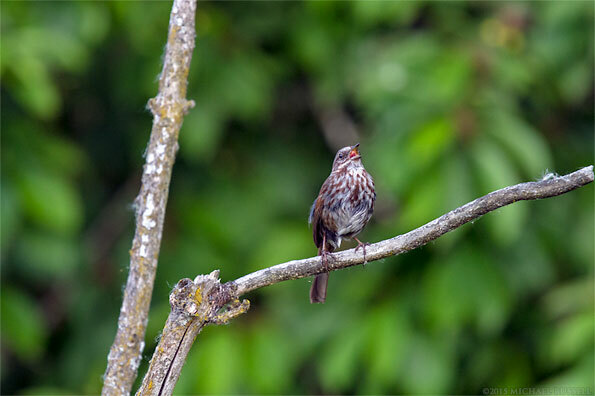 I photographed this Song Sparrow (Melospiza melodia) singing along the boardwalk over the marsh at Elgin Heritabe Park in Surrey, BC earlier this spring. I visited this park several times to photograph the Red-winged Blackbirds and on this occasion had this Song Sparrow sit on a branch right in front of me and start singing. I was able to make several photographs, and record two videos (see below) before the inevitable foot traffic of other park visitors caused it to fly away. Still, having a sparrow land that close and start singing was a great opportunity, one that I was only able to capitalize on as I was walking around with my longer lens (70-200mm) on the camera at the time. Landscapes do not tend to catch me by surprise nearly as often as wildlife, so when walking around on trails I often have the long lens on my camera instead of my favorite landscape lens (17-55mm). This way I am not trying to change lenses in order to photograph a bird or other animal close to me which is an activity that usually results in a missed opportunity. The video linked below was recorded with my Canon 7D and its internal microphone which leaves a bit to be desired as it picks up all sorts of background noise. 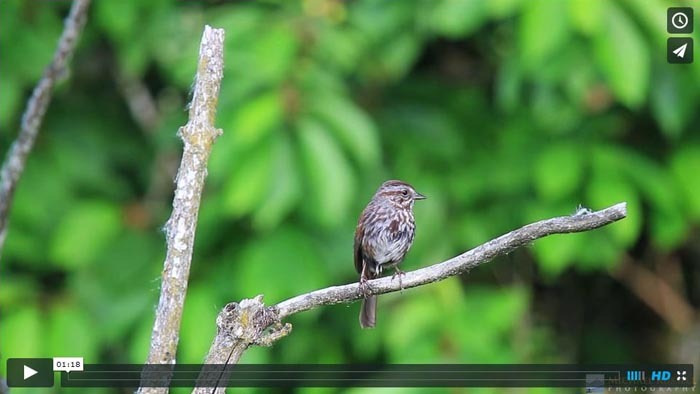 In the video you can hear the Song Sparrow singing, but you’ll also likely notice other birds singing, the flock of geese flying overhead, frogs, and the sounds of a speed boat accelerating up the nearby Nicomekl River. For more of my photographs of wildlife and animals please take a look at my Animals and Wildlife Gallery.